Baby boomers are the darling of the travel industry. And why not? Most are empty nesters and have the time, desire, and expendable income to travel. According to AARP, most Boomers (99%) will take at least one leisure trip in 2017, with an average of five or more trips expected throughout the year. The generation born between 1945 and 1964, Baby Boomers make up approximately 26% of the U.S. population and are responsible for 80% of all luxury travel spending. According to a study by the George Washington University School of Business and the Adventure Travel Trade Association, Boomers have generous budgets and are seeking trips that offer authentic cultural experiences. Baby Boomers have the proverbial “bucket list” – a collection of places and activities that they’ve accumulated over their lifetime – and are eager to now experience. These lists are as diverse as a wine tasting tour through Europe to climbing the Great Wall of China to scuba diving at the Great Barrier Reef. Baby Boomers are also seeking more specialized experiences. For example, many have been to Europe by this point in their life, but instead of traveling to the most-visited countries like England, France or Spain, they’re leaning toward smaller tours to less visited countries like Romania, Georgia, or Albania with small custom tours like JayWay Travel which specializes in Central and Eastern Europe. One of the biggest trends for the Baby Boomer demographic is luxury trekking. Destinations like Peru’s Sacred Valley and Machu Picchu are highly desired, topping many Boomer bucket lists, but the classic four-day Inca Trail which requires four nights of camping is a turn-off. Sure, they have porters to carry your gear, but at the end of the day you are still sleeping in a tent. However, tour providers like AdventureSmith Explorations offer a more trendy and appealing approach. Their tours start in Cusco and end in Machu Picchu with stays at cozy, luxurious lodges and customized hikes that range from easy to extreme. They successfully combine remote locations with high-end accommodations and must-see iconic sites. If you’re a history lover, traveling to the places where important things happened enlivens events and the people who participated in them. This provides valuable and very personal context. All over the world, we’ve found deep meaning and new perspective in visiting destinations specifically because they were the site of historical events: the beaches of Normandy, the Latin Bridge in Sarajevo, Johnstown and Gettysburg in Pennsylvania, the Bund in Shanghai. In other places, we’ve learned how shallow our knowledge and education was in terms of scale and significance: Hue, Belgrade, Luang Prabang, Darwin. Boomers are realizing that planning travel itineraries based upon significant historical events or periods in which they’ve been interested can be intellectually rewarding and lead to greater insights and understanding. Suggestions for boomer history-lovers in 2018: Laos and Vietnam, the Balkans, Philadelphia and Boston, and the Anasazi pueblo routes in the southwestern United States. Baby Boomers like to travel, and we Baby Boomers like to eat. More than that we are now seeking experiences like food walking tours and cooking schools. Whether it be a food walking tour in Athens, completing a paella class in Valencia, Spain, taking a glass of A Ginjinha in Lisbon and eating some Portuguese tarts with a local guide, we baby boomers love experiences. We want to visit the markets before cooking a Thai banquet on the Chao Phraya River in Bangkok and to cook pasta in Tuscany, Italy. Food walking tours and cooking schools are a significant travel trend. Visiting ancestral homelands is a booming travel category for baby boomers (pun intended). With the popularity of genealogy television programs, decreasing costs and ease of DNA testing, and natural affinity for the hobby, more and more people now tackle family history research projects. About 20 years ago, I traced my MCCOOL family line to a tiny (actually no longer existent) village in Northern Ireland. 10 years ago, we visited the original McCool family house which has stood since at least 1670. Have you visited your ancestral homeland(s)? Lucky us. Just as we slide further into the Boomer age group, the definition of ‘adventure’ broadens to include us. Adventure travel used to describe risky activities like rock climbing, white water rafting, and endurance challenges high and low. Now boomers embrace ‘soft adventure’ as part of their travel mix. The adventure travel industry itself is reassessing activities as it learns from its aging clientele, offering plenty of options for various fitness levels and multiple generations. To many, adventure also signifies the cultural experiences and sustainability practices that are introduced through local tour operators. We began our active travels with walks and hikes–across Spain on the Camino, into caves, up volcanoes, and through many national parks. This past year we were thrilled to participate in our first self-guided bike tour, in Brittany, France, and to see aquatic life up close from stand-up paddle boards and kayaks. We’ll be back in the bike saddle in 2018, ready to explore new turf. If the going gets tough, we won’t be ashamed to try an electric bike. The point is to get out there and enjoy the lay of the land. Walking safaris in Zambia? River cruising in Myanmar? Getting off-the-beaten-path in the eco-chic Bocas del Toro islands of Panama? On these recent trips of ours, most guests were like-minded boomers. Our generation sunned ourselves at Club Meds in our 20s. Winter holidays with kids to Mexico, Hawaii and the Caribbean followed. We toured Europe in our 40s. Now as we hit 50, 60 and 70, we have the time and means to venture beyond the tried-and-true destinations. We’re lusting to experience the exotic – to explore exotic destinations, taste different foods and learn about unfamiliar cultures. Expect exotic travel to be high on boomers’ vacation wishlists for 2018. As a recent empty nester, I finally have the freedom to take longer trips than ever before. I recently went on my first round the world cruise, which is a current trend for American Boomers. And although I only did a portion of the voyage on Holland America’s Grand Pacific and Far East Voyage, I can tell you, there were literally thousands of American baby boomers cruising! It seems most people that I met have been on some portion of this type of cruising more than once. I even met a couple who had been cruising with Holland America for more than 22 cruises. And after my month of cruising, I cannot recommend Holland America enough for its amazing service and great tasting food! Most Baby Boomers finished their formal educations some time ago, but we often choose to use our travels for immersive educational opportunities. We like cruises that provide topical expert lectures about the history and culture of places we’ll be visiting. Writing, photography, and cooking workshops are full of traveling Baby Boomers, and we can be found plunked down in language schools all over the world. Road trips are a great way for Boomers to go out and explore the gorgeous, national parks, regional places of interest and visits to metropolitan cities in the US. An easy getaway plan or longer visit, road trips can be casual with just a place and reservation made at a local inn or iconic place to stay. The country is filled with such amazing landscape and places to explore, it’s so easy to come and go based on what piques your interest or discover along the way. You can check out these amazing USA road trips here for more inspiration on what to see and do around the USA and hopefully, some of these magnificent places will inspire you to take a road trip for 2018. Want to explore the easy way? Try an expedition cruise. Also known as adventure cruises, these journeys take you to far-flung destinations for a close-up look at wildlife, landscape, and culture. A growing travel trend, expeditions cruises range from budget to ultra-luxury. Forget crowded ports or shopping, you’ll travel on small ships that focus on experiencing a place. Knowledgeable guides accompany you on walks with penguins in Antarctica, meet-ups with the locals at a sing-sing ceremony in Papua New Guinea, or floating among the giant icebergs in Greenland’s Scoresbysund. From easy snorkeling to difficult hikes there’s an expedition cruise adventure with your name on it. Offering a wide range of cultural, culinary, and scenic itineraries, European river cruises have been and continue to be popular with baby boomers. Whether well-traveled or new to travel, many boomers enjoy leaving the planning and details to the cruise line, including the structured (yet optional) excursions and the great onboard meals. We most often travel to several cities on trips, so river cruises are a nice change; we can see numerous places without needing to change hotels and there are beautiful views along the way. We’ve also found European river cruises to be a wonderful way to discover places that we’d like to visit later for longer stays. When it comes to luxury (and almost anything else), baby boomers can’t be pigeonholed: Their definitions of luxury boomer travel are as varied as they are, preferring to be defined by their interests and passions than by their age. Nonetheless, born of Depression-era parents, boomers are always mindful of value. That’s one reason why, with a mostly-inclusive, very competitive pricing model, Viking Ocean Cruises has grown rapidly since the launch of the Viking Star in 2015. In 2018, a fifth ship will be joining its fleet of 930-passenger vessels that also include the Viking Sea, Sky, and Sun. The United Nations called 2017 the year of Sustainable Travel, but this trend and its principles and practices are here to stay. Baby Boomers continue to dominate the travel marketplace and savvy tour operators are taking notice. This is especially relevant to high-end planners who find older travelers don’t want to sacrifice comfort or style but are increasingly concerned with their carbon footprint. They are looking for responsible luxury. Companies like AdventureSmith Explorations, whose principles are based on sustainable travel, are expanding into more categories that boomers find attractive. Cultural heritages, multigenerational outdoor activities, preserving indigenous crafts are all important aspects of itineraries. Stricter permitting in places such as Machu Picchu and other World Heritage sites mean it more important than ever to work with a company that has responsible travel already in place. Globetrotting Baby Boomers are likely to be focusing on big bucket-list type trips that have elements of conservation, wildlife, and culture. Eco credentials for both hotels and planners will become more important than ever. What could be sweeter than travel focused on chocolate and cacao? Doreen Pendgracs has been immersed in the world of artisanal chocolate and cacao since 2009, traveling around the world to cocoa plantations, chocolate festivals, attractions, and spas. Her favorite chocolate experience to date? Having her body covered in a warm chocolate paste made from locally grown cacao in Costa Rica, being wrapped in banana leaves, and then having to wash it off in an outdoor jungle shower after the healing qualities of the cocoa had released endorphins into her body that made her giddy, and made her skin feel like silk and smell like fresh chocolate. Learn more about Doreen’s world of chocolate travel here. Volunteering is a growing trend among boomers as we’ve reached the stage in our life where we have acquired enough material possessions and rather than gathering more, feel it’s time to give back to the world. We’re also at the stage in our lives where we have more free time available and in most cases have skills that are in demand in developing countries such as finance, fundraising, nursing etc. A country in need of volunteers is Guatemala, as it has one of the world’s highest mortality rates for children under the age of five. There’s something so nourishing about getting away with a few gal pals. It’s a chance to do things you might pass on if you’re traveling with your life partner. Boomer gals also have the gumption. We’ve been around, know our limits and what works or doesn’t. Connect with a traveling sister and you’ll have great company without the same ego-salving demands as traveling with your guy (usually!) Each year my sibling and I take off together and one of our most memorable trips was wandering East Texas for ten days. From brunch, art galleries in Marfa to horse-back riding, it was easy-going fun. From my San Diego base, I can wrangle a few girlfriends together and drive into Baja for wine-tasting in the Valle Guadalupe or culinary adventures in Ensenada or Tijuana. I wouldn’t trade those girlfriend day trips for anything! It’s not just birds that migrate to warmer climes in the winter months. Lots of Boomers do, too (especially those who are retired, semi-retired or whose business isn’t geography dependent)! I’ve lived most of my life in the Midwestern U.S., and escaping cold, snowy weather is something more Boomer generation friends and family members do during their retirement years. Florida, Alabama, and other coastal locations are most popular for Midwesterners, but some Snowbirds fly farther south, taking up temporary residence in Mexico, the Bahamas and throughout the Caribbean. Some end up purchasing condos or homes in their favorite location, eventually making it their permanent residence. For Boomers with working spouses (like mine), just escaping for a shorter time to somewhere warm and wonderful is enough to sustain us, like the 10-day Windstar Tahiti and Tuamotus cruise we returned from in early December. But (sigh…) I look forward to becoming a full-fledged Snowbird in years to come! Baby Boomers are traveling Internationally to seek remedies for their aches and pains from long flights and excessive adventures. One of my more memorable ones was a trip to Thailand and Malaysia where we had massages, pedicures, facials and an antioxidant treatment which was similar to a sauna. I recommend massages anytime for jet lag! If you are in Phuket Thailand try the Centara Cenvaree Grand Spa, or if you are in Ipoh Malaysia make sure you set aside several days for the Banjaran Hotsprings Retreat. It’s the number one Spa in the world in my humble opinion and you won’t be disappointed I guarantee! It was an experience I’ll never forget—my granddaughter wiggling in her seat on the plane exclaiming excitedly about the turquoise waters beneath us as we approached the airport in Aruba. It was her first international trip and I was thrilled to be next to her when she received her first passport stamp. On a glamping trip in Central Florida, my grandson exclaimed, “This is the best day ever!” These experiences are priceless—and multi-generational travel makes experiences like this possible. As families grow and new generations are born, it’s important to keep the family ties strong. Traveling together helps. Baby Boomers love to experience the local flavors in more ways than one when they travel. We find that it’s difficult to beat a way to savor the flavor in a new destination than taking a wine, beer or spirits distillery tour. Not only does one have the opportunity to learn about a local business and their history, but it provides time to pick up tidbits of information concerning the people of the area and cultural nuances. In Scotland and Ireland, there is endless opportunity to visit whiskey distilleries and sample a wee dram of the nectar of the region. Countries such as South Africa and Croatia are lesser known for their wine growing and producing regions than many other countries. The wine tour options around the world are endless, and we always make a point of trying a new to us producer that we can’t find at home. The craft beer industry has been booming for over a decade and shows no sign of slowing down – plus, there is usually a beer style to please most palates. So, we suggest you take a wine, beer or distillery tour when you travel and you’re bound to be thrilled for so many reasons. Remember… no drinking and driving! Sure, Baby Boomers want to take their one or two big trips a year…a European cruise, a safari in Africa, visit an iconic site like the Taj Mahal, Machu Picchu or the pyramids of Giza. But we also want to enjoy ourselves on the weekends, closer to home. Those trips don’t require as much planning or flights, and can often be spontaneous. These are road trips that can include visits to wineries, hiking at a nearby mountain range, or relaxing at a coastal beach resort. These small-but-frequent trips make our everyday life all the more enjoyable! Click on the image below to PIN Baby Boomer Travel Trends so you can find it again! Filed under Baby Boomer Travel, Feature, Travel Tips. 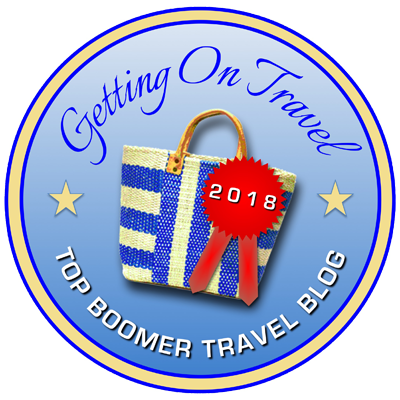 Tagged baby boomer travel, Baby Boomer Travel Trends, boomer travel. I’m glad it was helpful, Evan! I hope you and your wife have a FABULOUS time! So glad I could help you with travel inspiration! My first grandchild is due in late April, I so look forward to being able to travel with my grandchildren in the future 🙂 I certainly want to travel sustainably with them, would feel very wrong to fly extensively and exploit the countries we visit. I want to show them how to live and act with responsability and compassion. Thank you Luggageandlipstick for all the amazing travel trends! Truly inspiring and encourages my Wanderlust list to expand into a longer list. 🙂 Being bathed in chocolate sounds incredible. Thank you also for all the inspiring photos. Makes me want to see all of these places in person. What’s your favorite place you have traveled? Thanks for including me in the list! I’m looking forward to exploring many of these travel trends…in 2018 and beyond! Wonderful list for someone who travels as much as we do and have travelled in a number of these categories. Great to find my friend Doreen included for her chocolate tours. After reading this list, boomers will have enough travel ideas to last a lifetime! Thanks for including mine. This is so wonderful. Thank you for including my experience. Keep on traveling! Thanks for the trend post, Patti. What an interesting array of travel styles. It’s nice to see that many overlap, taking personal development and sustainability into account. There’s really something for every boomer traveler here. Besides the European River cruising that I wrote about, I enjoy several of the travel styles in the list. Haven’t tried Adventure cruising yet, but it sounds fascinating. What a great (and inspiring) list!